Sarah Beeson Andersen graduated in 1998 from CDO High School where she was an All American swimmer in the 50-yard freestyle and swam the butterfly to help her 200 medley relay team to not only a CDO record time but an All American time. As a first baseman, Beeson Andersen led the Dorados to the playoffs all four years batting .492 with 9 home runs, 22 doubles, a .696 slugging average, and 107 RBI, all CDO records. All told, she holds 14 batting records in addition to earning the Marion Donaldson Academic Excellence Award and graduating class valedictorian. 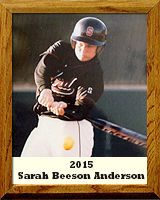 Beeson Andersen attended Stanford University where she batted .350 with 28 home runs and 66 doubles leading the Cardinal to their first College World Series in 2001 and earned All American honors her sophomore, junior and senior years. She was awarded Most Inspirational Player (1999), Coaches’ Award (2000), and the Pam Strathairn Award (female senior with the best competitive attitude, 2002), and the Block S Award (Most Outstanding Female Athlete of the junior class, 2001). Additionally, she earned First Team Academic All American her senior year. Upon graduation, Beeson Andersen attended Washington University Medical School for two years where she was an assistant coach for their undergraduate softball team. She earned a spot on the Olympic training squad, but failed to make the final cut for the 2004 Olympic team. Beeson Andersen coached high school softball in New Hampshire for 2 years. She also played for the New England RipTide and was selected as a National Professional Fastpitch All-Star.